Every four years the best young athletes from across the country gather to compete in the Canada Winter Games. From sports like skiing to skating to hockey, these Games can serve as the stepping stone for the next generation of great Canadian athletes. 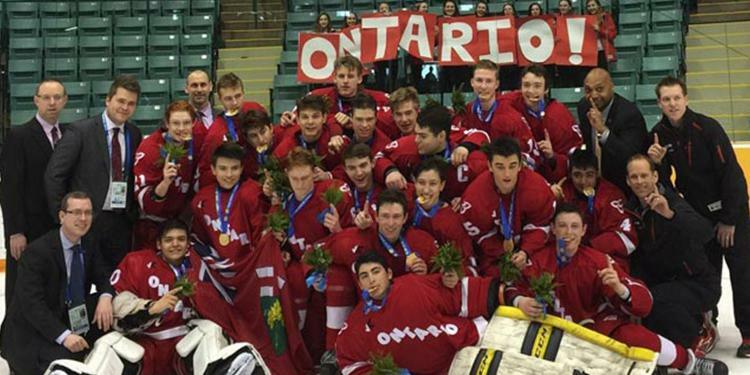 The Team Ontario hockey team consists of the top U16 players from across the province. In the last 13 Canadian Winter Games, Team Ontario has earned five gold medals in the sport, one silver medals and two bronze medals. They are the defending champions from the 2015 Canada Winter Games in Prince George, BC, having defeated Team Alberta in the Gold Medal Game. This team included OMHA players Jakob Brahaney (Quinte), Ian Blacker (Brampton) and Brady Gilmour (Quinte). Players will continue to be evaluated throughout the start of the 2018-19 season with the final team being named in early January. Prior to departing for the tournament, a camp will take place with all team members in Toronto. We spoke with Blacker, now a defenceman on the Oshawa Generals, about his memories from the 2015 Games and what he still values most from his experience. What was the experience of participating in the Canada Winter Games in 2015 like for you? It was my first taste of what it was going to be like in Junior, playing in the OHL. That was probably the biggest adjustment for me. It was my first time ever playing three 20 minute periods or having a 15 minute warmup before the game. I found that an adjustment as basically you have every opportunity in the world to do your best on the ice. That was one of biggest experiences, obviously playing against the best players in Canada and getting treated like a pro and having the support of other athletes at the venue. For the kids going it’s going to be the best time of their lives. I’m still really good friends with a lot of the guys on that team. I still keep in touch with a lot of them. I miss it, honestly. Can you describe the atmosphere for people who aren’t familiar with the Canada Winter Games? Is it like an Olympic Village? Yeah. You see your Ontario athletes all around. They come out to support you and we went out to support other athletes. We went out to go watch the ping pong team at one point and they synchronized swimming team always came to watch us play. It’s almost like you’re in Ontario, there’s so much support there. You represent your hometown playing minor hockey. You got to represent your province at the Games. What did that mean to you? It was one of those things that I didn’t really expect. When they first told me I made the Canada Winter Games I had no idea what it was. Then I started to grasp the magnitude of what it was. It was a big honour. I remember my teammates being really happy for me. I remember those moments, I didn’t really think it was true yet. It was all kind of falling into place for me. Once I was there it all kind of became surreal. 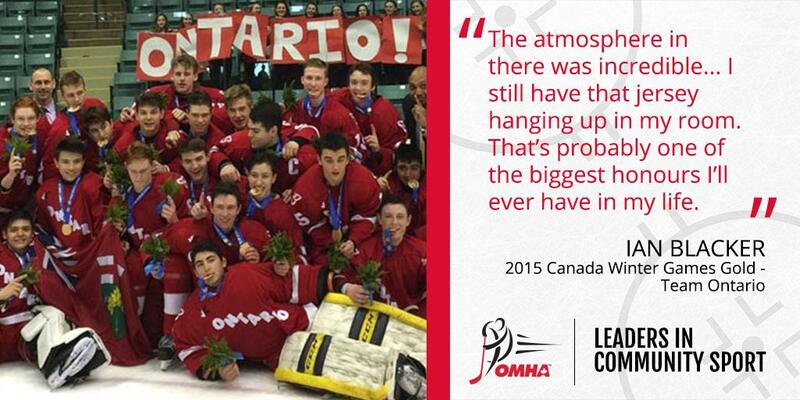 What did that mean for you to not only compete for, but also to bring home the gold medal for your province? That’s probably the best feeling I’ve ever had in the world. It was my first time ever playing in front of a sold out arena. The atmosphere in there was incredible. The whole athlete village was there to watch us. It was a nailbiter but it was a really good game. I remember the team came to play well. A couple key players stepped up in the game. We ended up bringing home gold. The players now are going through the evaluation process. What sort of advice would you give players who end up making the team? Go in with an open mind. They’re going to be pushed out of their comfort zone. The biggest thing I had to learn, and I’m sure other guys would say the same, is it’s not about you anymore. It’s about your province and your teammates. We had guys who were always on the powerplay with their regular teams and maybe would have to go kill a penalty. We had a saying, we were called the ‘power kill’ because we would block shots and everybody bought in. I think that’s the biggest advice I would give – it’s not about you anymore, it’s about your province. If you have 20 guys all bought in, then it’s all good. You guys will bring home the gold. 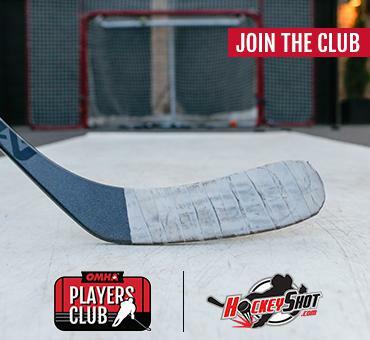 It’s been four years since the Games but how did the experience of competing at there influence your hockey career thus far? It was my first time getting a taste of what it’s like to be a pro. I learned a lot of thing from my coaches there. I see the systems that they’re using in the NHL and that was all the stuff I was taught at a very young age. I think I was 14 or 15 years old. I still have that jersey hanging up in my room. That’s probably one of the biggest honours I’ll ever have in my life. From February 15 until March 3, 2019, the eyes of the nation will be on Red Deer, Alberta as they host the 2019 Canada Winter Games - the largest multi-sport and cultural event for youth in Canada and the largest event to be hosted in Red Deer’s history. Featuring over 150 events in 19 sports and a major arts and cultural festival, the 2019 Canada Winter Games will welcome up to 3,600 athletes, managers and coaches and more than 100,000 spectators. The 27th edition of the Canada Games, the 2019 Games is set to provide a stage for Canada’s next generation of national, international and Olympic champions to compete and will leave a legacy for athletic and leadership greatness. For more information on the 2019 Games, visit: canadagames.ca/2019.